On this date in 1936, the temperature in New York City soared to 106°F. It was the hottest day ever recorded in the Big Apple. This triple digit heat was part of an extreme heat wave that impacted most of the mid-west and northeastern United States. It was an extension of the massive heat dome that built up over the Great Plains a few weeks earlier. Nationwide, this extreme heat caused approximately 5000 deaths, nearly 100 of which were in NYC. During the 1930’s – the height of the Great Depression – air conditioning was not very common. 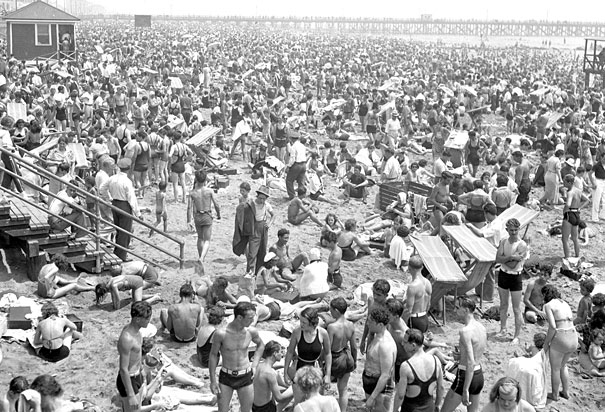 Many New Yorkers sought relief at city beaches and parks. At night, some even slept outdoors. More recently, it is interesting to note that between 2000 and 2009, NYC only had one 100°F day. In the last four years, however, we have had five days hit the century mark. This entry was posted in weather and tagged heat, history, nyc, summer by Melissa Fleming. Bookmark the permalink.